How Risky Is Berkshire Hathaway, Inc.? Berkshire Hathaway is a low-risk stock, if you invest the right way. Warren Buffett-led Berkshire Hathaway (NYSE:BRK-A) (NYSE:BRK-B) has a track record of exceptional performance. In fact, over the past 50 years, Berkshire's stock has risen at an annualized rate of 20.8%. No stock capable of these returns is without risk, but if you're a long-term investor, you may be surprised at how low-risk Berkshire Hathaway is. Berkshire CEO Warren Buffett has made it clear to potential investors many times that Berkshire Hathaway can be a risky stock to own over short periods of time. Circulation of Berkshire's print newspapers could (and probably will) continue to fall. Online retailers are a threat to Berkshire's brick-and-mortar retail businesses. If driverless cars grow in popularity, GEICO's premium income could shrink. BNSF Railroad transports a lot of coal, and this volume is certain to drop over the next decade. Buffett also wrote in a separate letter that for investors who plan to sell within a year or two, he can't promise a gain, no matter what the entry price is. Due to circumstances beyond Berkshire's control (such as the financial crisis), the stock has experienced large, rapid drops before, and will certainly do so again at some point. Buffett also points out that none of the risk factors are critical to the company's long-term well-being. In fact, when Buffett took over Berkshire Hathaway in 1964, it was simply a textile business, and one that Buffett knew would disappear one day. However, the company adapted, and has continued to do so ever since. Berkshire will also be financially solid, no matter what. Most of Berkshire's businesses have reliable streams of earnings, and the company maintains a cash stockpile of at least $20 billion at all times (currently $85 billion) with no significant short-term cash requirements. In fact, Berkshire has historically been able to do extremely well during the toughest economic times because of its financial strength. Improving the earning power of its subsidiaries. Making "bolt-on" acquisitions that complement current businesses. Benefitting from growth of the company's investments. Buying back shares when they trade at a discount (more on that shortly). Occasionally making a large, value-adding acquisition. For this reason, and because there is no way to reliably predict what the stock market will do next, Buffett recommends that you only buy Berkshire shares if you plan to hold them for at least five years. Additionally, he warns against purchasing Berkshire shares with borrowed money, pointing out that the stock has fallen by 50% from its highs before, and could certainly do so again someday. Such a drop wouldn't be fun for any shareholder, but could be a disaster for investors using leverage. It's tough to say that one time is better than another, because as I've discussed, the stock price of Berkshire is almost certain to climb over the long run. The company doesn't pay a dividend, and has no plans to, so this means that all of the profits are used to increase the intrinsic value of the company. Having said that, Berkshire does typically trade in a pretty consistent price-to-book range. Buffett has said that he would consider the stock to be extremely cheap at 1.2 times book value, at which point Berkshire would happily buy back its own stock. In fact, he said that buybacks at this level "would instantly and meaningfully increase per-share intrinsic value for Berkshire's continuing shareholders." 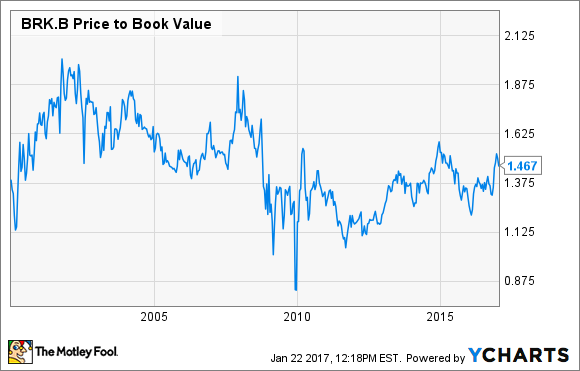 On the other hand, Buffett has also called the stock expensive (from a short-term perspective) when it approaches two times book value. At that price level, Buffett has said, it could potentially be many years before the investor could realize a profit. As I write this, Berkshire trades for 1.47 times book value, making it neither cheap nor expensive in a historical context -- although, if anything, it's a little on the cheaper side. Speaking of expensive and cheap stock, it's worth noting that there are two classes of Berkshire stock available to investors. The Class A shares are the original Berkshire shares and are much more expensive -- as of this writing, they trade for more than $238,000 per share. The Class B shares are the ones accessible to most investors, and they represent 1/1500 of the equity of the A shares, and therefore trade for about the same fraction of their price, about $158. Iif you plan to hold Berkshire shares for the long haul, you don't need to obsess over the valuation. One suggestion: dollar-cost averaging into a position in Berkshire is a smart way to go -- this way you'll buy more shares when it's cheap and fewer when it's expensive. In fact, this is how I've built my own position in the stock without worrying about whether it was a good time to buy.